Dr. Anita DeLongis received her doctorate in psychology from the University of California at Berkeley under the research supervision of Richard S. Lazarus. She completed a clinical internship in Behavioral Medicine through the University of California at San Francisco Family and Community Medicine Program under the direction of Donald C. Ransom. She then completed a National Institute of Mental Health funded postdoctoral fellowship in the Institute for Social Research at the University of Michigan under the supervision of Ronald C. Kessler. 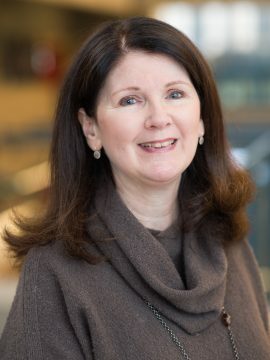 She joined the faculty at the University of British Columbia in 1988 and coordinates the program in health psychology, where she is also a faculty associate in UBC Faculty of Medicine’s International Consortium on Repair Discoveries. She has served on the editorial boards of Health Psychology, Journal of Social and Personality Psychology, Journal of Personality, Personality and Social Psychology Review, American Journal of Community Psychology, Journal of Family Psychology, Canadian Psychology, and Applied Psychology: Health and Well-Being. She is a member elect of the Academy of Behavioral Medicine Research, and is a council member for the Western Psychological Association. DeLongis has over a hundred publications and her work has been funded by the Social Science and Humanities Research Council of Canada, the Canadian Institute for Health Research, Canadian Foundation for AIDS Research, British Columbia Paraplegic Society, Rick Hanson Man in Motion Research Fund, BC Environment and Occupational Health Research Network, Peter Wall Institute for Advanced Studies, and the UBC Hampton Fund. Her work examines the interplay of stress and social relationships. Research interests include health psychology; stress; family and close relationships; coping with chronic illness. Stephenson, E., & DeLongis, A. (2018). A 20-year prospective study of marital separation and divorce in stepfamilies: Appraisals of family stress as predictors. Journal of Social and Personal Relationships. Stephenson, E., DeLongis, A., Bruel, B., & Badr, H. (2018). Outpatient pain medication use: An electronic daily diary study in metastatic breast cancer. Journal of Pain and Symptom Management, 55, 1131-1137. Müller, F., Stephenson, E., DeLongis, A., Smink, A., Van Ginkel, R. J., Tuinman, M. A., & Hagedoorn, M. (2018). The reciprocal relationship between daily fatigue and catastrophizing following cancer treatment: Affect and physical activity as potential mediators. Psycho‐Oncology, 27, 831-837. Pow, J., Lee-Baggley, D., & DeLongis, A. (2017). Who is most likely to seek and give support in the face of agentic and communal threat? The roles of extraversion and agreeableness. Journal of Research in Personality. DeLongis, A., & Zwicker, A. (2017). Marital satisfaction and divorce in couples in stepfamilies. Current Opinion in Psychology, 13, 158-161. Stephenson, E., DeLongis, A., Steele, R., Cadell, S., Andrews, G. S., & Siden, H. (2017). Siblings of children with a complex chronic health condition: Maternal posttraumatic growth as a predictor of changes in child behavior problems. Journal of pediatric psychology, 42(1), 104-113. Pow, J., King, D. B., Stephenson, E., & DeLongis, A. (2017). Does social support buffer the effects of occupational stress on sleep quality among paramedics? A daily diary study. Journal of occupational health psychology, 22(1), 71. Human, L. J., Chan, M., Ifthikhar, R., Williams, D., DeLongis, A., & Chen, E. (2016). Accuracy and positivity in adolescent perceptions of parent behavior: Links with adolescent psychological adjustment and proinflammatory profiles. Social Psychological and Personality Science, 7(8), 796-805. King, D. B., Kamble, S., & DeLongis, A. (2016). Coping with influenza A/H1N1 in India: Empathy is associated with increased vaccination and health precautions. International Journal of Health Promotion and Education, 54(6), 283-294. Pow, J., Lee-Baggley, D., & DeLongis, A. (2016). Threats to communion and agency mediate associations between stressor type and daily coping. Anxiety, Stress, & Coping, 29(6), 660-672. Human, L. J., Dirks, M. A., DeLongis, A., & Chen, E. (2016). Congruence and incongruence in adolescents’ and parents’ perceptions of the family: Using response surface analysis to examine links with adolescents’ psychological adjustment. Journal of Youth and Adolescence, 45(10), 2022-2035. Kukowski, C., King, D. B., & DeLongis, A. (2016). Protective effect of paramedics’ sense of personal accomplishment at work: Mitigating the impact of stress on sleep. Australasian Journal of Paramedicine, 13(2). Ho, A., Ashe, M. C., DeLongis, A., Graf, P., Khan, K. M., & Hoppmann, C. A. (2016). Gender differences in pain-physical activity linkages among older adults: Lessons learned from daily life approaches. Pain Research and Management, 2016. Manczak, E. M., DeLongis, A., & Chen, E. (2016). Does empathy have a cost? Diverging psychological and physiological effects within families. Health Psychology, 35(3), 211-218. Beggs, R. T., Holtzman, S., & DeLongis, A. (2016). Predicting daily satisfaction with spouse responses among people with rheumatoid arthritis. Annals Of Behavioral Medicine, 50(1), 24-33. Stephenson, E., Herriot, H., &, DeLongis, A. (2014). Daily dyadic coping predicts changes in marital adjustment among couples in stepfamilies across 2 years. European Health Psychologist, 16 (935). Human, L. J., Chan, M., DeLongis, A., Roy, L., Miller, G. E., & Chen, E. (2014). Parental accuracy regarding adolescent daily experiences: Relationships with adolescent psychological adjustment and inflammatory regulation. Psychosomatic Medicine, 76(8), 603-610. King, D. B., & DeLongis, A. (2014). When couples disconnect: Rumination and withdrawal as maladaptive responses to everyday stress. Journal of Family Psychology. For a full list of publications, visit the lab website.